Real Live Cookbook, Checking The Oil , Appearances, & Easy Pie Crust-Fit For A Pastry Chef! Don’t you think it’s time to toss out all of the unhealthy trans fats and hydrogenated oil (butter, margarine, shortening, and, perish the thought, lard), and begin cooking and baking healthier today? Your heart will say thanks, and your tummy will smile!!! As a fun contest, I am giving away a free cookbook to the person who can send me the funniest cooking story. The disaster stories are especially funny!!! Are ya game?? Invite a friend to my blog to share a story too…. 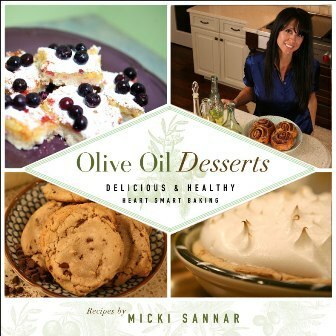 I am on a mission to find the most delicious, nutritious, & super amazing olive oil to bake my desserts with. Who wouldn’t be excited about all of the beautiful blends which have come in so far from several of California’s finest olive growers? Cowabunga Dude, I can’t wait to start testing!!! Check out this video and learn more about making the perfect olive oil! Easy Pie Crust-Fit For A Pastry Chef! Below is the now famous, Perfect Olive Oil Pie Crust recipe. Even Chef Bryan, who is a trained pastry chef; and the host of Fresh From The Kitchen, was surprised when he tasted it. I believe his exact words were ,” I think that this is the most amazing pie crust I have ever tasted”. But don’t take his (or my) word for it, try it out for yourself, and see how very easy it is to prepare. Use your favorite pie filling or try mine. either way, if you were not a pie person in the past, you just might become one now…(in my humble opinion). If you live in Utah or Idaho, catch me mixing it up with Chef Bryan next Monday, March 30th, on channel 2 (KUTV) at noon. We are making the healthy, yet sometimes evil, Chocolate Sin Cookies! 1 In mixing bowl add flour, sugar, and salt. Mix together. 2 Add olive oil, buttermilk, and vanilla. Using a spatula, blend all ingredients. If necessary, add a sprinkle of flour to create desired texture; not too wet and not too dry. 3. Divide dough into 2 equal parts. Form balls and wrap individually in plastic wrap. Flatten with the palm of your hand. Let rest for 5~10 minutes (no need to refrigerate). 4. Roll out between wax or parchment paper. Assemble pie according to pie filling recipe instructions. the sugar stick to the crust as well as making the pie look shiny. Thanks for stoppin by!!! As always, your comments are welcome. With heart disease on the rise and unhealthy trans fat making headlines as one of the main culprits, many people are looking for better ways to improve their diet. The challenge is that most baked goods contain unhealthy trans fat and hydrogenated oils. For this reason, many people find themselves having to say ”No” to the one food group they love the most – dessert.